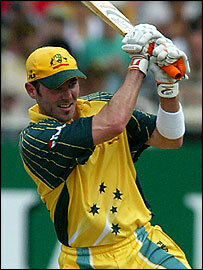 Damien Martyn predicts a string of retirements from the Australian team after the 2007 World Cup. Half the players in the current side are over 30 years of age and must be considered to be in the twilight of their careers. "I think you'll probably see a mass exodus of the guys after the World Cup from one-day cricket, and rightly so," Martyn told The Sydney Morning Herald. "It would be amazing to play three World Cups and win three." Martyn said the future of the Test team was less clear, however. "If the selectors feel they want me to keep playing Test cricket after that, I'd think about it. I'll never hang on until my last dying breath." Martyn, 33, said the ousting of Darren Lehmann from the side before the current tour of New Zealand was a sign that team members cannot be guaranteed of a long-term place. But he feels close to all the players. He said: "I see these guys more than Mum and Dad. I'm on the road 10 months a year, we live in each others' pockets, we help the guys who are sad and laugh with the guys who are happy. "There are lots of emotions. I class us as one big family. One of the big reasons we're number one is because we handle that so well. "So when someone goes out of that, and Boof [Lehmann] was a big part of what we've been, you just feel sad about that." Can Aussies keep their squad together until the next World Cup?